- As the redheads have fairer skin tone, the probability of it getting damaged by the sun rays is very high. The harmful UV rays can lead to skin cancer. Therefore, it is necessary that moisturizer with SPF 15 or more should be massaged all over the body whenever going out. - Having freckles on the face is sign of being a redhead. Many women try to hide them by foundation, but it isn’t necessary. Keep them light but don’t hide them. When selecting a color for foundation, go with the one which matches your skin tone and hair color. Don’t select red or pink based shades. Instead choose peach, ivory, yellow, gold or any other warm shades as your foundation color. Keep the foundation light as much as you can, because then it will highlight your natural skin color. - Eye makeup is bit tricky as color of eyes has to be kept in mind while applying makeup. Never apply black mascara. Instead choose brown shade for mascara. For eye shadow, select colors like green, golden, brown, terracotta, light purple, caramel etc. Copper, brown shades look cool with blue eyes. For green ones, shades of green, plum will look good. For eyeliner, shades from light brown to dark brown are available. Choose according to your shade of red in hair. - Smokey eyes can also be practiced for some dramatic effect. Brows and lashes of redheads are very light in color and that is why they have to be colored too. Brown is the recommended color, but you can also go with the auburn color. 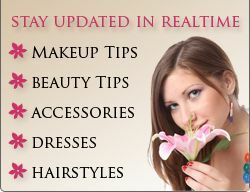 - Choosing a color for lipstick is easy as compared to others. You can go with colors like pink, plum, orange, peach, light brown, cinnamon. If you want to apply red lipstick then keep in mind the red shade of your hair and then only select the right shade of red lipstick. Never go with dark red color or purple color for a lipstick. - For blush color, stick to natural/warm colors or coral shades. Avoid red or pink shades. You can select peach, yellow shade instead. Choose the shades properly while applying makeup. It is important that you don’t select wrong colors otherwise you won’t look beautiful. Having red hair is a trend nowadays, so you can go to a salon for getting red hair if you naturally don’t have them.